The continuing education courses we offer will provide education and training to water operators that is both practical and interesting. These courses cover a wide range of topics including water treatment related topics such as coagulation and flocculation and water distribution topics such as storage tanks. 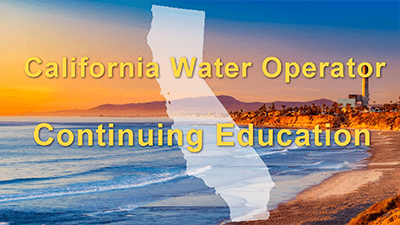 Completion of our continuing education courses will count toward the number of continuing education hours a water operator must complete to renew their license with the state of California. If you need California water treatment operator continuing education or water distribution continuing education, purchase with confidence knowing that we have the approved online CE that you need. What are the CE requirements for California water operators? All of our courses are approved to apply to your license, regardless of type or grade. Select any of the classes listed below to renew your certification. Save on our 36 Hour CE Package! Includes: Surface Water, Source Water, Coagulation, Disinfection, Corrosion, Oxidation, WD Overview, Pipelines, Meters, Pumps, Basic Electrical, Wells and WD Quality. Save on our 21 Hour CE Package. Includes: Surface Water (3 Hours), Source Water (2.5 Hours), Coagulation (3 Hours), Sedimentation (3 Hours), Disinfection (2.5 Hours), Corrosion (3 Hours), Oxidation (2 Hours) and Membrane Processes (2 Hours).